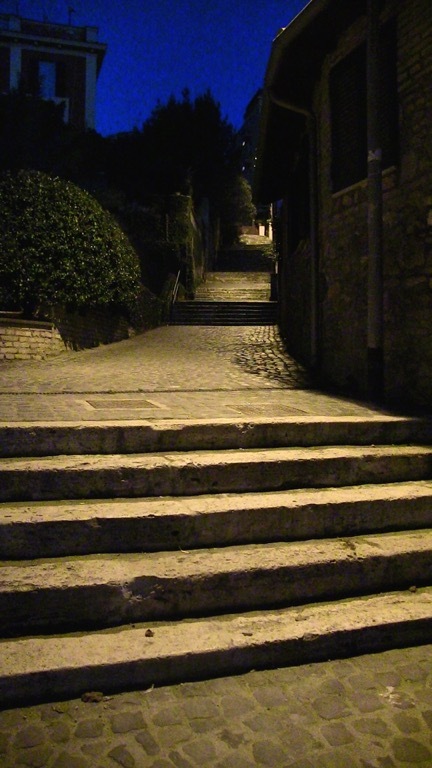 Rome is great place to work the steps, whether you’re in recovery and working the 12 steps (for which there are programs of all sorts conveniently listed on line) or just trying to keep in shape. The Steppes are a different matter entirely. You’re not going to find too many of those in this city surrounded by hills—even though it was the famed she-wolf, a creature of the Steppes, if there ever was one, who nurtured Romulus and Remus. 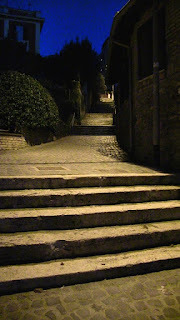 If you live on a hill like the Gianicolo you have a choice of steps which will take you down to the nearby Trastevere neighborhood. The only problem is coming back up after a heavy meal and wine. Rome doesn’t sport many high tech gyms like the ones you find in American cities, but the city is a walking gym. Having one of those step machines you find in American gyms would be redundant in Rome and also a joke to a population who take climbing in their stride. What’s so astonishing is how ubiquitous these steps are. You can’t get away from them and it’s apparent that in ancient times, there weren’t too many worries about wheelchair access—probably due to the fact that the life span of the citizenry was so markedly shorter that there weren’t worries about accommodating to those who weren’t able to climb up and down. There are, of course, a lot of famous Italian bikers, but when it comes to physical fitness you might think that New Yorkers one up Romans due to the huge variety of venues in which to work out. But in Rome fitness fanatics are not easily distinguishable from average people, since everybody has to do lots of step work to get from here to there.